Peter Sergeant of PerlCareers put together his website very last-minute and without much thought or consideration. He wanted to increase the number of developers who submitted their CVs. He purchased the Incredible Conversion Audit from us to help him achieve this. Wanna see all the sweet deliverables he received and how we made this happen for Peter? Then, keep reading my friend. 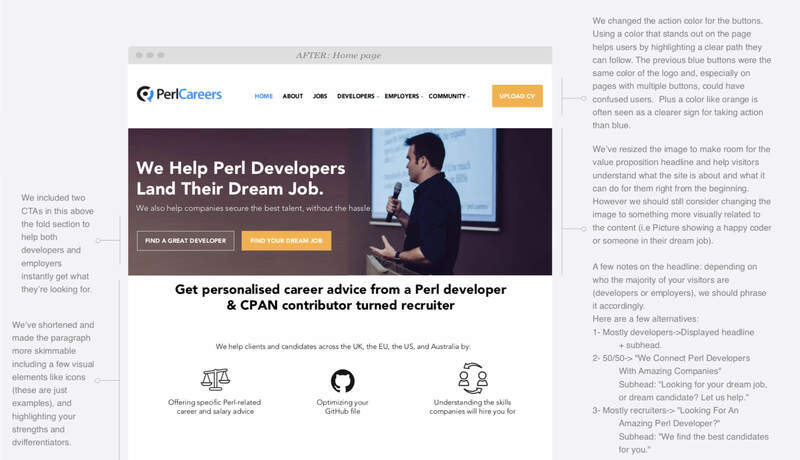 PerlCareers is a Perl-focused recruitment consultancy, run by Peter Sergeant – a Perl recruiter with the unfair advantage of being also a Perl programmer. They help companies hiring developers, by introducing them to Peter’s network of friends, former coworkers, open-source collaborators and contacts all over the world. They make it easier for Perl developers to find their dream job, by advising them on cultural and tech backgrounds, salary and guiding them through their application and interview process. Low website visitor to CV Upload rate and a haphazardly designed website. Peter was looking for help to increase the number of people who submitted their CVs or resumes on the website after having looked at a job posting. Out of their total monthly visitors, around 3% to 5% ended up on the Upload CV page, and only 1.76% submitted their CVs. Since each good candidate is worth between $1,500 to $3,000, even a 1% increase in visitor to CV Upload rate, could have meant doubling revenue for PerlCareers. 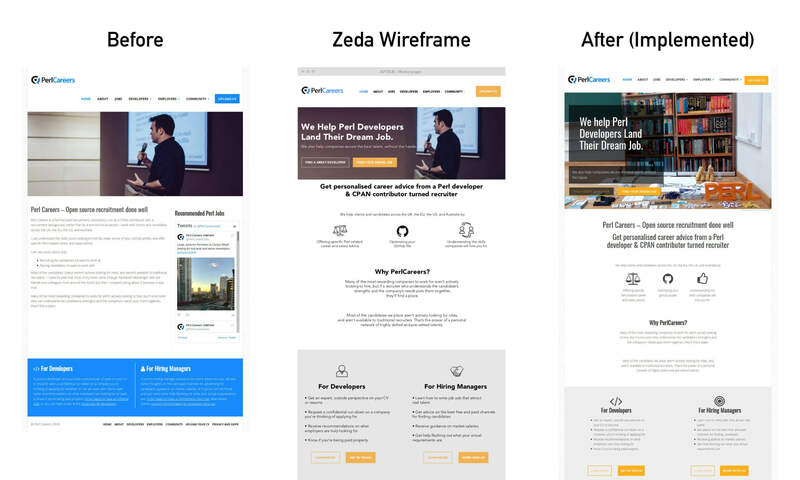 However, their website had been created without any real thought towards what the target audience needed, and Peter didn’t have time to dig deeper into how users interacted with it, even less to test different variants with an A/B test. Peter had never worked on a similar project before and finding someone he could trust wasn’t easy. Enter the Incredible Conversion Audit. Peter knew about Zeda Labs and the quality of our work, after attending one of our workshops. As soon as he found out about it, he decided to purchase an Incredible Conversion Audit since, at that price, the potential ROI looked like a no-brainer. If the changes helped him make just ONE more sale, the audit would have paid for itself. He needed help improving the home page and one key page, where visitors looked at a job opening and uploaded their CVs. PerlCareers got access to a team of conversion experts, focused on analyzing and improving their business the 80/20 way, at 1% the cost of a complete redesign project. And with potential to add thousands of dollars to their bottom line. Our team worked on the structure and flow of the pages and proposed new copy that really highlighted PerlCareers’ unique selling proposition. Peace of mind, clarity and only a few minutes of work required. All Peter and PerlCareers had to do was to implement those changes and let their newly revamped website do the hard work of attracting and converting great potential candidates. After executing on our recommendations and findings, PerlCareers got the peace of mind that their website was optimized to get the most out of the traffic they were getting. Most importantly, they only had to put in 30 minutes of work to make sure implementation would be successful. 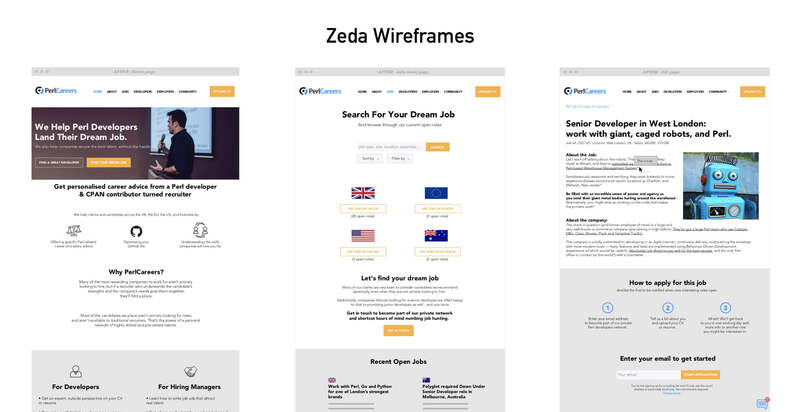 Ready to get Zeda-fied and Recover Your Missing Revenue? Then it’s time to deploy the Zedanauts to find all those money-stealing conversion crimes holding your business back and make it rain. We’ll run a usability test to find your sites biggest flaws, then use our intuition and experience to guide our work. Check out our other Conversion Audit Packages.